Chinese tech giant Xiaomi recently unveiled a new Mi WiFi router with built-in storage. It offers improved transfer speed rate, high speed connectivity and storage space upto 6TB. The Mi WiFi Router supports 802.11 ac standard and powered by a dual-core 1.4 GHz Broadcom 4709c processor. It boosts 512 MB of RAM. It comes in two variants – 1TB and 6TB versions. You can also backup images from your smartphone (or your camera), thanks to their respective Android and iOS apps. The 1TB version will be priced around RMB 699 (around INR 7,195) and the 6TB version will be priced around RMB 2999 (around INR 30,872). According to the pictures, this comes in both black and white versions. 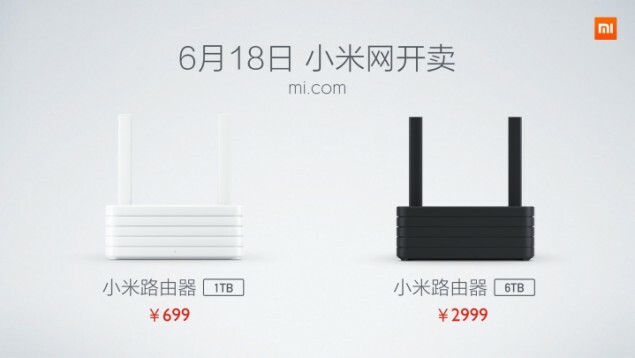 The Mi WiFi Router will be available for sale on Xiaomi’s website on June 18, we are not sure about the availability date for Indian market. Apart from this, Xiaomi also introduced two smart devices – i-Youth Smart Air Conditioner and Yeelight Bedside Lamp. You can control them via your smartphone as well. It’s good to see brands like Xiaomi coming forward with such devices, thanks to Internet of Things perhaps? Coming back to the Mi WiFi Router, with high speed connectivity and built-in storage, I think this is worth the deal. Do let us know your views in the comments below.